Happy Memorial day from Esthetic Living! Here at Esthetic Living we are firm believers that a good pillow restyling can completely refresh and renew any room. In just a few minutes, you can transform your space to look pulled together, modern and sophisticated. 1. Stick to your colors! It is important that you pick a color palette that allows for beautiful deep, light and neutral tones. Once you’ve picked your basic colors, you can style within that palette. By doing this, you leave room for mixing and matching while staying true to the style of your space. These beautiful pink pillows from Bungalow pair beautifully together. 2. Change up the sizes of your pillows – Vary from circular shapes, to big squares and small rectangles. This will allow you to layer your pillows and add more depth and character to your space. 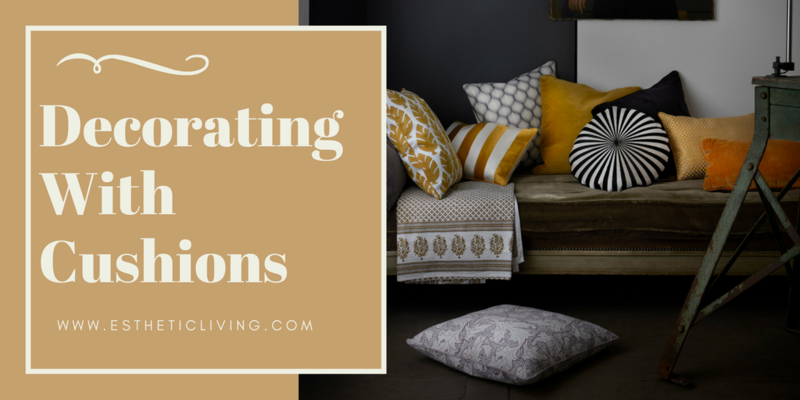 Mixing and matching different shape and size pillows adds a unique lived in charm to your space. 3. Mixing Patterns? Layering patterns can add a lot of character to any space. If you chose to do this however, you must be sure to use both large and small scale patterns; if they get too similar then they start to compete and create visual chaos. By layering different size patterns, you can add character to a room while keeping a neat and sophisticated look. 4. Texture is key! This becomes especially important if you are mixing solids. Including pillows with different textures and details will help bring some life to your arrangement and keep it from looking too boring. Textures play a huge part in getting your feel right. Velvet in particular, adds such a rich feeling and look to any home. Shop our Pillow Collection Here!